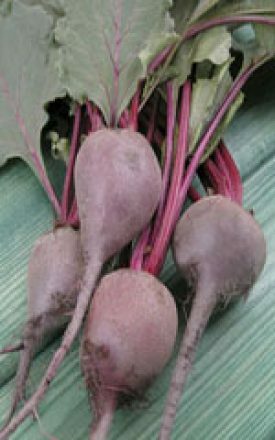 Early Wonder Organic Beet Seeds 4015 Heirloom Vegetable. Elongated roots are slightly flattened, semi-globe shaped with a smooth skin and solid flesh. Flesh is very sweet and tender with excellent uniformity and interior quality. Early Wonder comes up very quickly – even in cool soil. The tops make very good early season beet greens. Introduced around 1911. 60 seed/gram. Sow seed directly into the garden 1.25 cm (1/2″) deep in rows 30-45 cm (12-18″) apart. Successive sowings as late as the first of July helps extend the harvest. 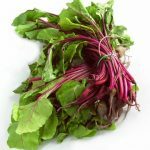 Beets produce a compound seed which means each seed can produce up to 4 sprouts so thinning is essential for good root formation – thin seedlings to 10 cm (4″) apart – you can use the tops of thinned beets as a source of baby greens. Irrigation is important during dry spells up until the roots begin to swell. Fertilizer improves quality and size of roots.